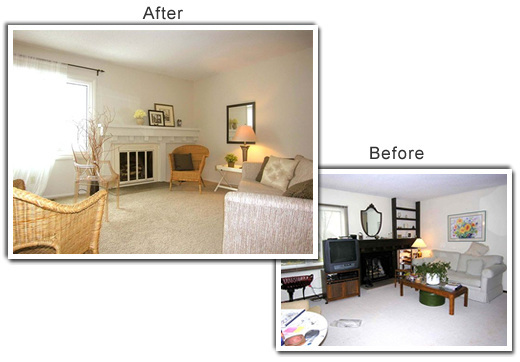 The living room of this Bloomington townhouse had good proportions and a wood-burning fireplace but suffered from bad carpeting, tired furnishings and a dated mantel and fireplace surround. "The fireplace might actually be considered a major turn-off for buyers," said Lori Matzke of Centerstagehome.com. Matzke's challenge was to turn the fireplace into a positive selling point and give the living room a more updated, contemporary feel. Worn and stained carpeting throughout the townhouse was replaced with a more contemporary style. Putting the same carpeting in all the rooms improves the flow and makes the space seem larger. To make the rooms feel warm and contemporary, Matzke painted the walls and wood trim a soft cocoa with an eggshell finish. Matzke updated the mantel by removing the dated, built-in shelving, priming and painting the rough wood with an oil-based, semi-gloss paint that's slightly lighter than wall color. She painted the black surround the same color with a heat-resistant paint. And the black cement fireplace box was scrubbed clean with baking soda and a metal brush. To brighten the rooms with natural light and to create a connection between the living room and and dining room, Matzke replaced the metal mini-blinds with the same $6.99 Swiss-dot sheers she used in the dining room. The stained and worn sofa was recovered with an inexpensive slipcover and moved into a secondary bedroom along with the TV to create a cozy den. Matzke then replaced it with a vintage 1960s-style piece that was in the master bedroom. Matzke borrowed a couple of wicker side chairs that match the chairs in the dining room to create an open conversation area that shows prospective buyers how the space could be used. The chairs help the room feel more contemporary and add additional seating without too much bulk. To draw the buyer's eye into the space and reflect light, she hung a large beveled mirror on the wall and added an acrylic chair she found at an estate sale.